All appears complete with no missing or ripped pages, outer cover has been previously taped as shown in the images. Used but in good condition and fully operational with obvious signs of age related wear. 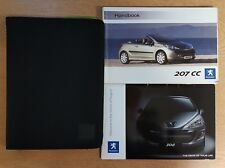 PEUGEOT 207 OWNERS HANDBOOK WITH WALLET. PEUGEOT WALLET. Owners Manual - which covers the 1.4, 1.6, 1.6T Petrol and 1.4, 1.6 litre Diesel models (Printed 09/2007). (MY REF: PE 1291). This is a GENUINE Peugeot item. MAKE AND MODEL -Peugeot 207. It does NOT cover Peugeot 207 CC Coupe/Cabriolet. 1.6 THP Petrol engines - 150 bhp. 1.6 VTi Petrol engines - 120 bhp. This is a GENUINE Peugeot item. MAKE AND MODEL -Peugeot 207. It does NOT cover Peugeot 207 CC Coupe/Cabriolet. (MY REF: AK 84). 1.6 THP Petrol engines - 150 bhp and 175 bhp. 1.6 Petrol engines - 120 bhp. (MY REF: ACQ 5474). This is a GENUINE Peugeot item. MAKE AND MODEL -Peugeot 207. It does NOT cover Peugeot 207 CC Coupe/Cabriolet. You will receive the Peugeot wallet. 1.6 THP Petrol engines - 150 bhp. Peugeot 207 & 207 SW owners handbook, covers models from 2006 to 2009. PEUGEOT 207 & SW. DRIVERS MAIN HANDBOOK. GENUINE WALLET. AUDIO INSTRUCTIONS AND MUCH MORE. PEUGEOT 20 7 AND SW. THIS HAS ALL THE INFORMATION ON HOW TO OPERATE YOUR PEUGEOT SAFELY AND PROPERLY. DRIVERS HANDBOOK. GENUINE WALLET. PEUGEOT 207 OWNERS HANDBOOK. SO DONT MISS OUT! GENUINE PEUGEOT WALLET. PEUGEOT 20 7 AND SW. THIS HAS ALL THE INFORMATION ON HOW TO OPERATE YOUR PEUGEOT SAFELY AND PROPERLY. DRIVERS HANDBOOK. GENUINE WALLET. IN VERY GOOD CONDITION. Peugeot 207 owners handbook, covers models from 2006 to 2009. SUPER CONDITION CASE HAS HISTORICAL WEAR & TEAR. FIRST EDITION PRINT DATE 10-2006. (MY REF: PE 1213). This is a GENUINE Peugeot item. MAKE AND MODEL -Peugeot 207. It does NOT cover Peugeot 207 CC Coupe/Cabriolet. You will receive the (very slightly grubby ) Peugeot wallet. The bottom third of this handbook has been damp and the outer covers and inner pages are wavy in appearance. PEUGEOT 20 7 CC. THIS HAS ALL THE INFORMATION ON HOW TO OPERATE YOUR PEUGEOT SAFELY AND PROPERLY. DRIVERS HANDBOOK. GENUINE WALLET. This is a GENUINE Peugeot item. MAKE AND MODEL -Peugeot 207. It does NOT cover Peugeot 207 CC Coupe/Cabriolet. (MY REF: AK 115). 1.6 16v THP Petrol engines - 150 bhp and 175 bhp. 1.6 VTI Petrol engines - 120 bhp. It does NOT cover Peugeot 207 SW Estates or Peugeot 207 CC Coupe/Cabriolets. This is a GENUINE Peugeot item. MAKE AND MODEL -Peugeot 207. It covers Peugeot 207 Hatchbacks from 2005 - mid 2009. (MY REF: AK 54). PEUGEOT 20 7 AND SW. THIS HAS ALL THE INFORMATION ON HOW TO OPERATE YOUR PEUGEOT SAFELY. DRIVERS HANDBOOK. GENUINE WALLET. PRINTED 2006. SUITABLE FOR 1.4, 1.4 16V, 1.6 16V, 1.6 TURBO HDI, 1.4 TURBO HDI & 1.6 TURBO HDI 16V. RARE PEUGEOT 207 HATCH. 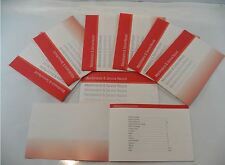 OWNERS MANUAL & WALLET SET. 2006-2009 MK1 Peugeot 207 OWNERS MANUAL WALLET. There is no service book included. Please make sure part is correct before purchasing. We try to describe our parts as honestly as we can, however please also see our images in case we have missed anything. Any questions please ask. International buyers please contact us for price and availability of postage to your location. Removed from below vehicle -. PEUGEOT 207 CC OWNERS HANDBOOK. SO DONT MISS OUT! GENUINE PEUGEOT WALLET. (MY REF: PE 1271). MAKE AND MODEL -Peugeot 207 CC. It covers PRE FACELIFT Peugeot 207 CC Coupe/Cabriolets from 2007 - mid 2009. It does NOT cover Peugeot 207 SW Estates. It does NOT cover Peugeot 207 Hatchbacks. PEUGEOT 20 7 AND SW. THIS HAS ALL THE INFORMATION ON HOW TO OPERATE YOUR PEUGEOT SAFELY AND PROPERLY. DRIVERS HANDBOOK. GENUINE WALLET. PRINTED 2009. IN VERY GOOD CONDITION. (MY REF: PE 1257). MAKE AND MODEL -Peugeot 207 CC. It covers FACELIFT Peugeot 207 CC Coupe/Cabriolets from mid 2009 - 2013. It does NOT cover Peugeot 207 SW Estates. It does NOT cover Peugeot 207 Hatchbacks. (MY REF: ACQ 6928). MAKE AND MODEL -Peugeot 207 CC. It covers PRE FACELIFT Peugeot 207 CC Coupe/Cabriolets from 2007 - mid 2009. It does NOT cover Peugeot 207 SW Estates. It does NOT cover Peugeot 207 Hatchbacks. PEUGEOT 20 7 AND SW. THIS HAS ALL THE INFORMATION ON HOW TO OPERATE YOUR PEUGEOT SAFELY AND PROPERLY. DRIVERS HANDBOOK. GENUINE WALLET. PRINTED 2009. IN USED BUT GOOD CONDITION, SEE PICTURE TO CONFIRM. PEUGEOT 207. DRIVERS HANDBOOK / OWNERS MANUAL. DRIVERS HANDBOOK. FOR 3/5DR HATCHBACK / ESTATE 2009-2013 FACELIFT CARS. ALL INFORMATION HOW TO OPERATE YOUR CAR SAFELY AND PROPERLY. NO ORIGINAL CASE. PRINT DATE 2006. PEUGEOT 20 7 AND SW. THIS HAS ALL THE INFORMATION ON HOW TO OPERATE YOUR PEUGEOT SAFELY AND PROPERLY. DRIVERS HANDBOOK. WARRANTY HANDBOOK. GENUINE WALLET. PRINTED 2009. PEUGEOT 207 OWNERS MANUAL DRIVERS HANDBOOK 2009 - 2013 Inc WALLET. Condition is Used. Dispatched with Royal Mail 2nd Class Letter. Suitable For Peugeot Service History Book. This Is A Generic Service Book Suitable For Any Car! Suitable For All Peugeot. This Is An High Quality Full Color Book. Which Is Designed To Cover The Specific Range. PEUGEOT 207 OWNERS HANDBOOK-MANUAL. COVERS ALL ENGINE DATA. PEUGEOT 207 SW ESTATE & HATCHBACK OWNERS HANDBOOK. ( REF KU77). 1 PEUGEOT 207 SW ESTATE & HATCHBACK OWNERS HANDBOOK. 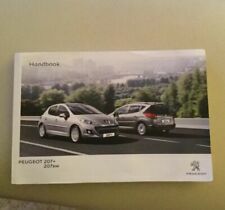 1 GENUINE PEUGEOT HANDBOOK WALLET. MANUAL AND AUTOMATIC VERSIONS. Genuine Peugeot wallet for the books to go into. PEUGEOT 207 CC OWNERS HANDBOOK-MANUAL. COVERS AN OVERVIEW OF ALL 207 CC MODELS. MAINTENANCE & TECHNICAL ADVICE//SAFETY DATA.